Operators of a 63-year-old coal-fired passenger ferry that carries people and cars across Lake Michigan between Wisconsin and Michigan have made the necessary environmental improvements to keep the vintage vessel in service, U.S. regulators announced Thursday. The 410-foot SS Badger launched in 1952 can carry 600 passengers and 180 vehicles. It's the last coal-fired steamship operating on the Great Lakes and normally runs from May to October. It is scheduled to resume service Friday between Ludington, Michigan, and Manitowoc, Wisconsin. The U.S. Environmental Protection Agency said inspectors this week confirmed that Lake Michigan Carferry Service Inc. "has taken all the steps necessary to permanently stop the discharge of coal ash" into the lake. In September 2013, the EPA had given the Badger's operators until this year to stop dumping ash into the lake. Operators have spent about $2.4 million on an onboard system to move ash from the ship's four boilers to four retention bins on the car deck, the EPA said in a statement. "The Badger car ferry is now in compliance with the Clean Water Act and will no longer discharge coal ash to Lake Michigan," EPA regional Administrator Susan Hedman said in a statement. "EPA is pleased that we were able to find a solution that protects Lake Michigan and preserves jobs along the Michigan and Wisconsin shoreline." Previously, ash was transported from the boiler to an onboard retention area, mixed with Lake Michigan water and discharged in a slurry into the lake. The ash will be sold for use in cement-making, according to Chuck Leonard, vice president of Lake Michigan Carferry. The Badger was built to the standards of its day, which once allowed trash and sewage of all lake vessels to be jettisoned overboard, Chuck Cart, chief engineer on the Badger for 19 years, said in January. It's been modified as new standards have come into place, he said. The S.S. Badger is the last coal fired steamship in the Northern Hemisphere, not just the Great Lakes. Used with permission of Frank Hicks from the April 9, 2015 Hicks Car Works Blog. The Illinois Railway Museum has the largest and most complete collection of surviving equipment from the Chicago Surface Lines, the famed system that operated more than 3,000 streetcars over 1,000 miles of track spread out across the city. The CSL was the nation’s largest street railway company but today only a dozen or so streetcars exist as memorials. Of those, car 2843 is something of a gem hidden in plain sight. It was built more than a decade before the CSL came into being, for predecessor South Chicago City Railway, and it was retired from passenger service quite early. Through various tricks of fate it has survived to the present day yet its history is largely unknown. As a member of a small and largely unremarked series of cars its story has not been widely told, and as an unrestored artifact it has garnered little attention among the museum’s vast roster. 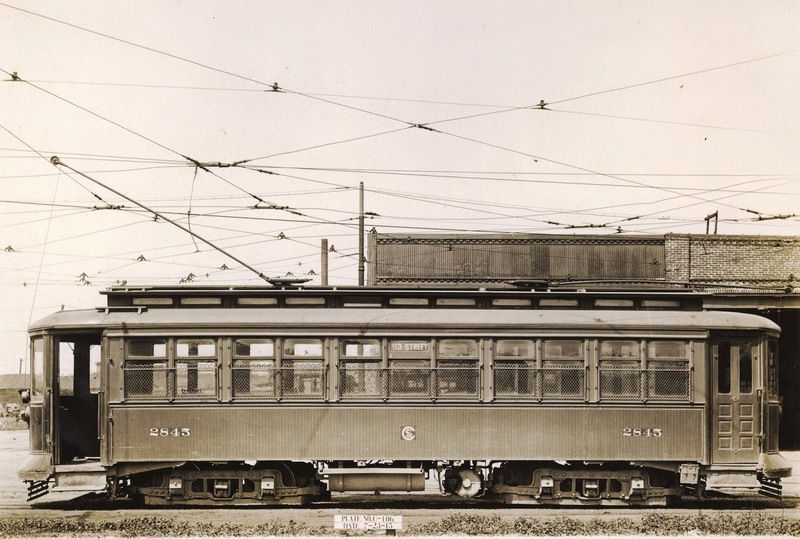 Yet car 2843 stands out in the Chicago streetcar collection as a fascinating example of car design in the years before the city standardized its surface fleet, an exemplar of the car builder’s art of the time, and an artifact remarkable in how original it has remained. This account would not have been written without the invaluable input of Roy G. Benedict, who lived much of his life on the southeast side and provided historical descriptions of the South Chicago streetcar lines and the Jewetts in particular as well as photos and proofreading assistance. Art Peterson and George Kanary supplied in-service photos of the Jewetts while Ray Piesciuk and Joe Stupar located and scanned original photos and car diagrams of the cars. Ten miles south of the Loop, along the Lake Michigan shore near the mouth of the Calumet River, sits the commercial center of South Chicago surrounded by the neighborhoods that make up the southeast side of Chicago. Just west of the mouth of the Calumet, South Chicago long served as the focal point of this area with its thriving downtown at 92nd & Commercial and its neighborhoods housing the thousands of workers who earned a living at the giant US Steel plant on the lakeshore. Clustered around South Chicago are the neighborhoods of South Shore to the north, Calumet Heights just to the west across the old Pennsylvania and New York Central railroads, South Deering with its industries along the Calumet River south of that, and East Side to the southeast hugging the Indiana state line. Before South Chicago was a neighborhood it was a city. Known as Ainsworth when it was first settled around 1833, it was known as South Chicago by the time it was annexed into Hyde Park Township in 1867. The 1870s saw efforts to dredge the Calumet River to make it usable for ships and in 1881 the North Chicago Rolling Mill, later to become the US Steel South Works, opened on 91st Street at the mouth of the river. More steel mills and other heavy industry sprang up along both sides of the Calumet River and the population of South Chicago steadily rose. In 1889 Hyde Park Township was annexed by Chicago, including South Chicago and the other neighborhoods of the southeast side. By that time South Chicago was already developing its own infrastructure, including that modern convenience, the horse car line. The Ewing Avenue Horse Railway began service in 1885 running along 92nd Street and south along Ewing Avenue to the east and along Commercial to the west of downtown South Chicago. Then in 1890, soon after annexation, a new mode of transportation arrived in South Chicago. On October 5th of that year the Calumet Electric Street Railway Company became the operator of the very first electric streetcar to run in Chicago. The CESR line looped downtown South Chicago and headed west along 93rd Street two miles through Calumet Heights to Stony Island Avenue, where the car house and generating station were located. 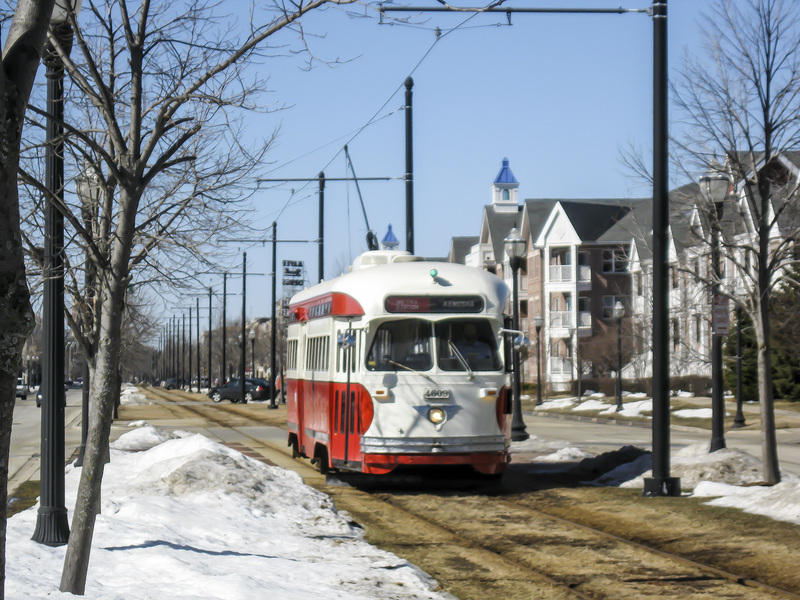 Part of the line’s purpose was to spur housing development in Calumet Heights, but the line also served as a testbed for this exciting new technology. The Chicago city fathers, who had previously barred electric cars from the dense city core due to safety concerns, eventually were convinced and Chicago ended up with the largest unified electric street railway system in the country. The owners of the Ewing Avenue Horse Railway saw the writing on the wall and elected to expand and upgrade, changing the name of the company to the South Chicago City Railway (SCCR). 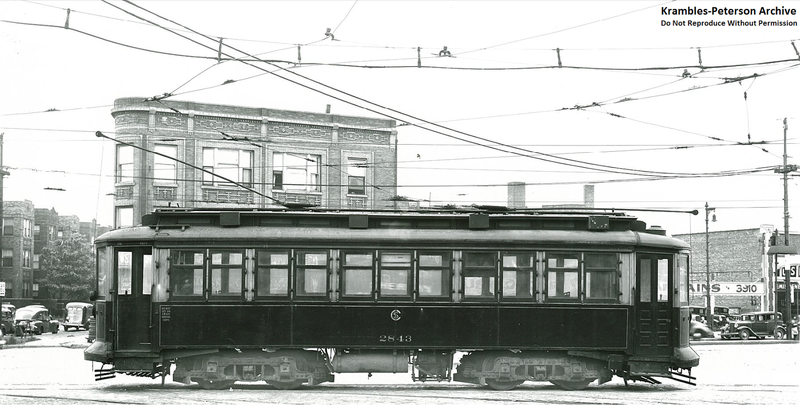 Under the direction of civil engineer James R. Chapman they bought 25 new electric streetcars and built an impressive new brick complex along Ewing just south of the Calumet River bridge that included a repair shop, car house, generating plant and offices. On March 4, 1893 they converted to electric power, and without any formal training at all the teamsters immediately became motormen. Fortunately some newly-hired conductors had experience with electric cars and the two-man crews figured out how to get the cars moving. An example of the SCCR fleet from the turn of the century is car 109, a single-trucker built by St. Louis Car Company in 1902. CESR and SCCR soon expanded to the north, with both companies building extensions to 63rd Street. The reason was twofold. First, the Columbian Exposition was being held at Jackson Park, drawing millions of people from all over the world to the fairgrounds along the east side of Stony Island Avenue between 56th and 67th. Second, South Side Rapid Transit, Chicago’s first elevated line, was completed to 63rd Street and Jackson Park in May 1893. This provided southeast side residents a direct ride to the Loop and a convenient and less inexpensive alternative to the Illinois Central Railroad. These track maps, drawn from 1908 valuation reports, show the SCCR and CESR at the final development of their route mileage. Not drawn to scale. The two competing streetcar companies continued to expand. SCCR painted its cars vermilion (red) with chrome yellow above and went by the nickname “Red Lines,” while CESR painted its cars yellow with orange above and was given unflattering monikers like the “yellow peril.” During the 1890s and early 1900s both lines vied for advantage, expanding into new neighborhoods like East Side and South Deering. CESR built a line east from downtown South Chicago to the gates of the US Steel South Works at 89th Street as well as a line down Avenue L as far as 109th that served the residential communities in East Side. The SCCR lines went as far south as 106th Street, where the cars ran from the state line through East Side across the Calumet as far west as Torrence Avenue in South Deering. This allowed the line to serve Wisconsin Steel, which occupied both banks of the Calumet south of 106th. SCCR also served Iroquois Steel, located along the lake just south of the Calumet River, and continued down Ewing through the heart of East Side. Eventually the car lines would stretch south along Green Bay Avenue, Burley and Carondelet as far as the neighborhood of Hegewisch. In 1896 SCCR began through service to Hammond and Whiting in Indiana over the Hammond Whiting & East Chicago, with the connection made at 106th & Indiana. By the early 1900s, the decade-old single-truck cars that had inaugurated electric service on the southeast side were fast becoming obsolescent, particularly for the longer and longer runs over the expanding car lines. Both CESR and SCCR looked to acquire larger, more modern double-truck cars. The Red Lines were first. In the fall of 1902 the SCCR built five cars in its own shops on Ewing. They were large cars, 45’ in length, and had a seating capacity of 54. They were single-ended, though there were poles and controls at each end, and passengers boarded and alit at a single entrance at the right rear corner. They were also spartan, with bowling-alley seating, and were essentially lengthened versions of the single-truck cars then holding down service. Within months the competing CESR had matched the SCCR by ordering eight new off-the-rack semi-convertibles from the J.G. Brill Company of Philadelphia. These cars were designed for double-end operation, with doors at the front left and right rear, and sat 44 passengers in relative comfort on cross seats. Brill was the best streetcar builder in the industry and these CESR cars were better built than the five cars constructed on Ewing. But before 1903 was out the Red Lines would boast of new cars to match those fielded by the Calumet line. The five cars ordered by SCCR in 1903 from the Jewett Car Company of Newark, Ohio were not the first double-truck electric cars in Chicago, nor were they the largest or the best-known. But they were among the finest and, in the words of Chicago traction historian James Buckley, they were “probably the best constructed wooden cars ever to operate” on Chicago’s streets. 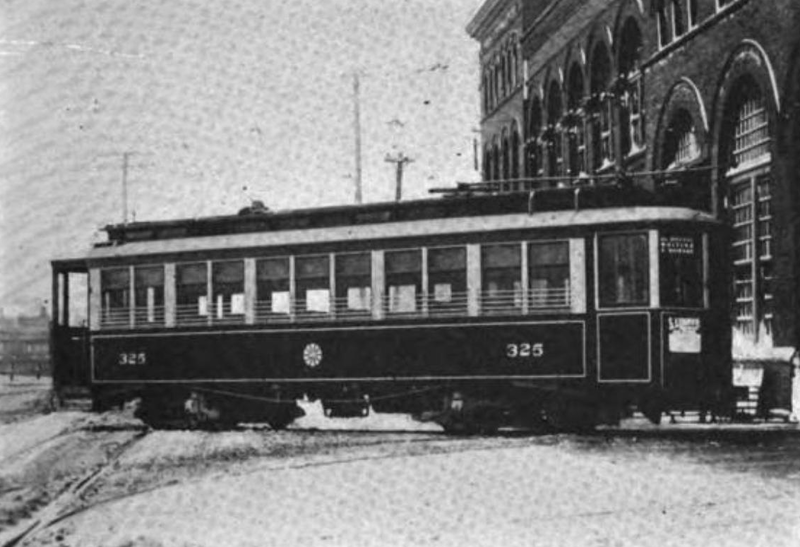 Car 321, the first of the series, is shown in public operation around 1905. The end of the car nearest the photographer is the rear end. Note the truss rods and script lettering on the car side. Fred J. Borchert photo, James Buckley Collection. SCCR cars 321-325 were built on lot 148, Jewett plan 134T, and cost $12,936.87 for the order. Jewett had built some single-truckers for SCCR in 1900 but the firm was best known for building large interurban cars. 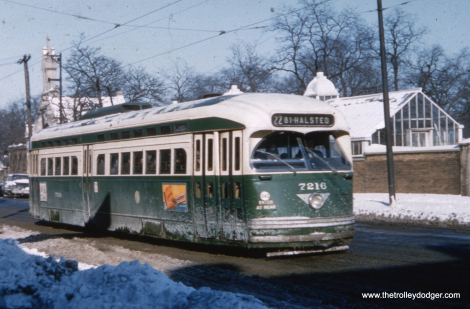 While the new cars were undoubtedly streetcars, there was a definite interurban influence in their design as well. In part this was because they were designed for through service to Hammond and Whiting in Indiana over the tracks of the Hammond Whiting & East Chicago, a 14-mile route that made for a jarring ride on a bouncing single-trucker. 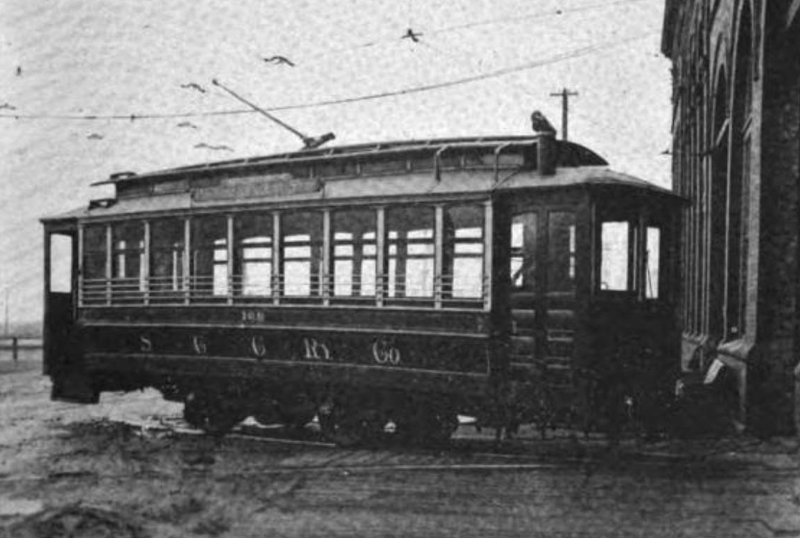 The SCCR was designed with single-ended cars in mind, unlike the bigger streetcar lines that ran to downtown Chicago, and in keeping with this the Jewetts were built with a front and a rear end. However they had controls and conductor’s bells at each end and could be operated in either direction if needed. The new Jewetts were 42’3” over the bumpers, much larger than the older single-truckers they supplanted. They sat 44 passengers on a mixture of cross seats and longitudinal bench seats, all of them upholstered in rattan. The cars had a separate smoking compartment at the front which seated 12 on bench seats and they had only a single passenger entrance, at the right rear of the car, plus a second door at the left front. Heat was provided by a coal-fired water heater located on the front platform to the motorman’s right. 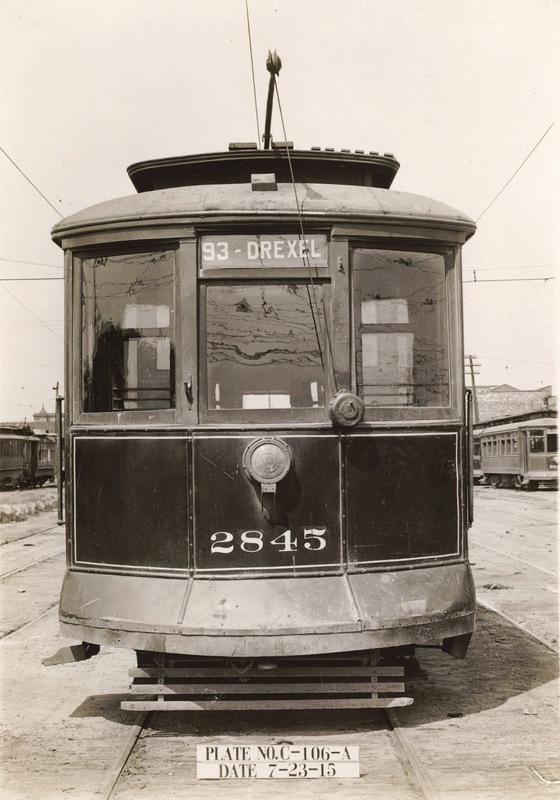 The cars had tongue-and-groove sheathing, truss rods, short 4’ deep platforms, and paired side windows (actually in a two-two-three-two-two arrangement), all features more common to interurbans than streetcars. The cars’ interiors were beautiful: varnished mahogany walls with inlay, quartered oak veneer ceilings, and Pantasote windows shades. This drawing from a 1908 valuation report depicts the original floor plan for the Jewetts. The front end of the car is to the right, with the round water heater on the platform and longitudinal seats in the smoking compartment. The cars were mounted on Taylor HSB2 trucks, the same as the homebuilt 1902 cars, and had GE 80 motors with K28F controllers. They were fitted with couplers, either for being towed or for hauling trailers; a Berg fender at the front; a Berg hand brake; and Van Dorn track scrapers. The conductor, who in these days before prepayment roved the car body to collect from passengers, used a Sterling-Meaker #5 to ring up fares. The cars were painted in standard SCCR colors: vermilion (red) sides and letterboards, chrome yellow along the windows, and varnished window sash. 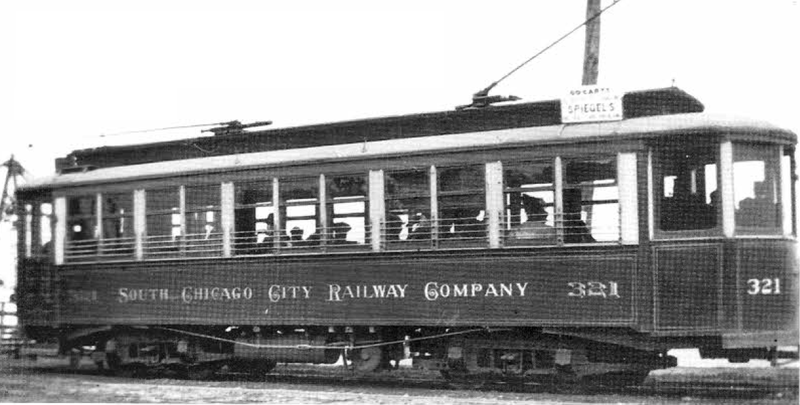 Letting included pin-striping, “South Chicago City Railway Company” spelled out along the car sides in ornate script, car numbers on the end painted in Roman typeface and – anachronistically – car numbers on the sides in old-fashioned shadowed lettering. The Jewetts presented an unusual marriage of modern car with antiquated livery. The new Jewetts were the pride of the fleet for SCCR and initially were assigned to the Interstate routes, originating at 63rd Street near the ‘L’ terminus and traveling through downtown South Chicago on their way to Hammond or Whiting. But as well-built as they were, their reign as the flagships of the fleet was short-lived. In late 1907 the Ewing shops began construction on a new series of 11 homebuilt cars. These cars, numbered 332-342, had even more interurban features than the Jewetts. In fact, by most standards they were more like interurban cars than streetcars, with railroad roofs and steep step wells. Their layout was generally similar to the Jewetts but changes were made to the smoking compartment at the front of the car, with removable (or “convertible”) wall sections for better ventilation during the summer and cross seats replacing the longitudinal seats in the smokers on the Jewetts. The biggest difference was that the rear platform was only partly enclosed, and rather than side doors had Minneapolis-style gates across the steps on the right side. The new cars, built especially for through service to Indiana, were dubbed “Interstates.” But the Jewetts were still modern and attractive cars and continued in daily service on the Indiana through routes and other heavy southeast side lines. Around 1906-1907 the SCCR color scheme changed; the familiar vermilion and chrome yellow livery was retained but the lettering was simplified, with Roman car numbers and plainer pin-striping. A round “Red Lines” emblem centered on the side of the car taking the place of the company name spelled out in script. This image from a 1908 valuation report on the SCCR shows what the Jewetts looked like after five years of service. The livery has been simplified, with the script lettering replaced by a “Red Lines” roundel. But SCCR was only to last a few months after the “Interstates” entered service. 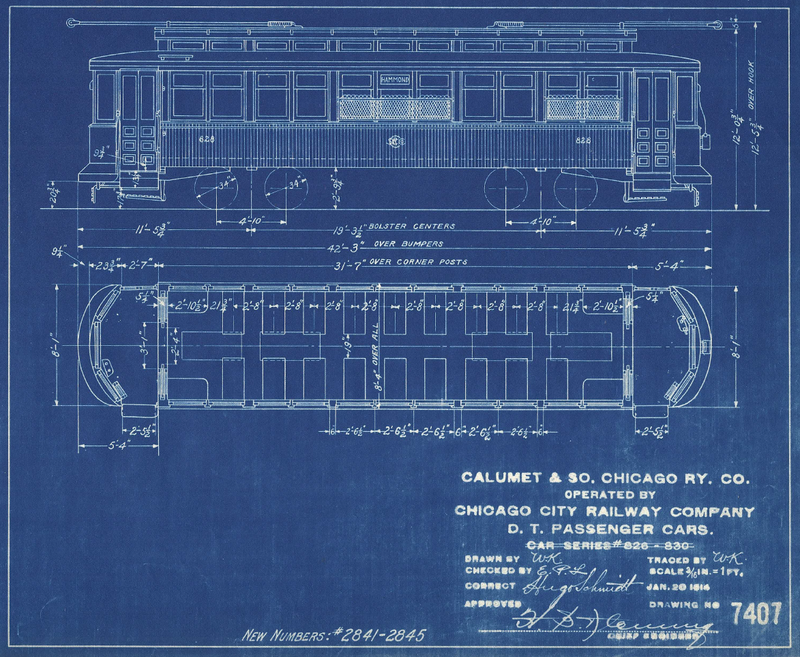 In May 1908 the “Red Lines” merged with its longtime competitor, the Calumet Electric Street Railway, to form the Calumet & South Chicago Railway (C&SC). With this, competing trackage – in some cases two lines just a block apart – could be rationalized and the schedules and fleets of the two lines could be combined to the best possible advantage. The company was managed from the large ex-CESR Burnside car house complex at 93rd & Drexel, which still stands as of this writing. The fleet was repainted, with dull Pullman green replacing the vibrant red-and-yellow of SCCR and yellow-and-orange of CESR, and the 321-325-series SCCR Jewetts were renumbered 826-830. The Chicago streetcar companies, slowly but inexorably, were consolidating. Under the direction of the Board of Supervising Engineers created by the city in 1907, changes were being made to improve and standardize the operating practices and facilities of the major streetcar companies in the city. By 1908, when C&SC was formed, there were only two other major streetcar companies in Chicago, Chicago Railways on the north side and Chicago City Railways (CCR) on the south side. And shortly after the merger management, though not ownership, of the C&SC was transferred to CCR. 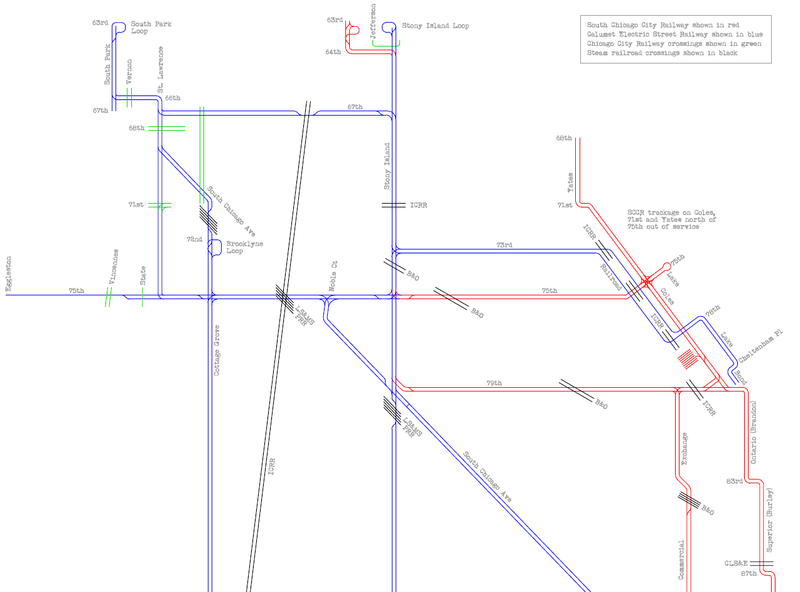 The new unified management of the “south side lines” – the CCR, C&SC and the relatively diminutive Southern Street Railway line on Cermak Road – began to rationalize and improve the C&SC operation immediately. Fifteen large double-truck Robertson-style cars were purchased from CCR to modernize the fleet, still largely made up by old single-truckers. All operations were moved to Burnside and the SCCR complex on Ewing and the car house on Coles Avenue in Cheltenham were sold. And the existing C&SC fleet was rebuilt and modernized. In 1910 the five Jewetts went through rebuilding. Though significant changes were made, the basic structure of the car was unchanged. They were converted to double-end cars, though they had already been capable of double-end operation. Doors were added at the left side of each end, giving the cars identical folding doors at all four corners. The cars had their truss rods removed (a testament to the cars’ sturdy design) and angled dashers were added to the ends. The couplers were removed, the original basket-type fenders replaced with trip-gate lifeguards, and wooden guards were added to the trucks. The original Stanwood steps were replaced with folding steps, the metal safety rods on the windows were replaced with ornate “south side style” mesh window guards, and sign boxes mounted in the end and side windows replaced the rooftop brackets for mounting wooden destination signs. This plan from 1914 depicts the Jewetts as they were following their 1910 rebuild. The smoking compartment bulkhead is gone, all four corners are fitted with doors (though no longer with step wells), and the entire car has cross seats except for the corners of the body. Illinois Railway Museum Collection. The cars’ interiors were modernized too. Heating was changed from hot water heat to electric heat and the stove on the front platform was taken out. The bulkhead between the smoking and non-smoking compartments was removed and seating was changed to all cross seats, with longitudinal seats only at the corners of the body. International fare registers replaced the old Sterling-Meaker type with which the cars had been built. The interiors kept their original mahogany finish and appointments, though, including the two-panel sliding doors in the end bulkheads. 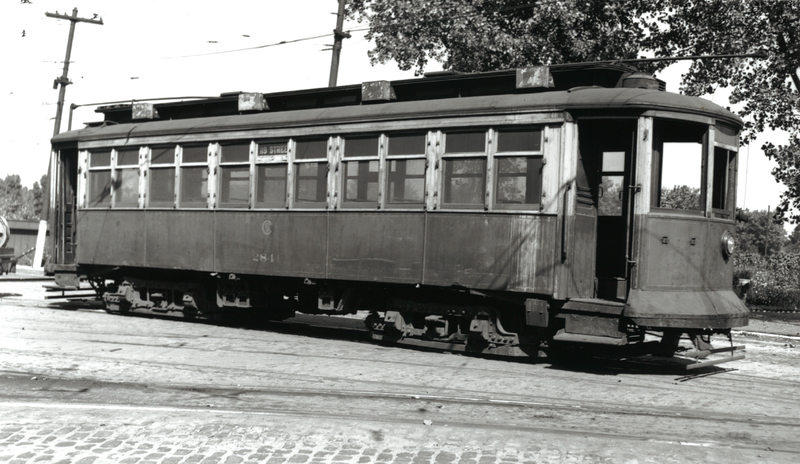 This is what the Jewetts looked like after rebuilding, though the photos date from five years later after the Chicago Surface Lines unification (note that the old C&SC emblems and numbers have been painted over on the car side). Illinois Railway Museum Collection. In the meantime, the trend towards consolidating Chicago’s street railways that had begun in the 1890s continued. In 1910 the C&SC’s ownership stake in the Hammond Whiting & East Chicago was sold, though through service continued as before. At about the same time more through service was instituted, but this time going north instead of east. 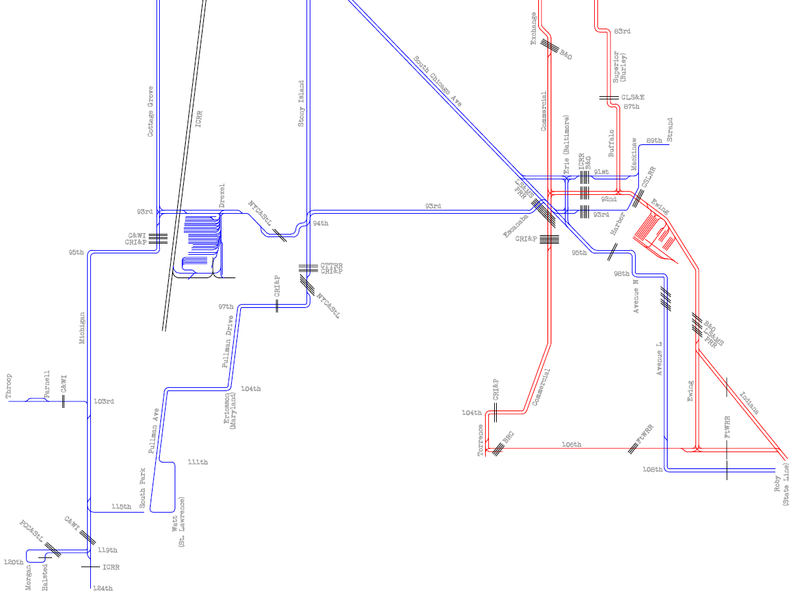 Through routes were being established all over Chicago, linking together the various component companies of the south side lines that were now under common management. And with the Unification Ordinance that went into effect on February 1, 1914, the city of Chicago reached the culmination of its consolidation trend. On that date the operations of the two big streetcar companies, CCR and Chicago Railways, were combined into one company: the Chicago Surface Lines. The Chicago Surface Lines, or CSL, was the operating company for the Chicago streetcar system and ownership of the fleet and property remained with the underlying companies, including C&SC. But with unification came further standardization and rationalization of car assignments. The Jewetts had recently been rebuilt to CCR specifications and were still rather new cars. But pay-as-you-enter (PAYE) fare collection, where a stationary conductor collected fares as passengers entered instead of roving the car seeking them out, had emerged as the safest and most efficient way to collect fares. So in 1914 the Jewetts were fitted for a conductor position on the rear platform, with a foot pedal to ring up fares, and the right-side door at each end was fitted with a crank so that the motorman could open the door for exiting passengers without arising. At some point, either in 1914 or in the years thereafter, the cars also acquired Utility ventilators. Some had their tongue-and-groove siding covered over with sheet metal panels. This original CSL blueprint shows planned changes to the layout of the Jewetts to permit their conversion to Pay-As-You-Enter fare collection. IRM Collection. The Jewetts also received a new coat of paint, with the CSL herald replacing the C&SC herald, and they received new numbers: C&SC 826-30 (originally SCCR 321-325) became CSL 2841-2845, with all five cars remaining in perfect numerical order. The cars remained in service on the southeast side, primarily seeing use on the ex-SCCR lines through South Chicago and operating out of Burnside car house, for the first several years following unification. But in 1921 changes began to come to the Jewett fleet. First, along with the rest of CSL’s cars they were repainted into the new fleet colors of carmine red with cream along the windows – a nearly identical livery to that they had worn in their first five years on SCCR. Second, they departed their old South Chicago territory with new assignments. The biggest drawback of the Jewetts was their short platform length. With platforms only 4’ deep and side entry doors 2’5” wide, compared with 6’1” wide entryways on the 1908-vintage “Old Pullmans” built for Chicago Railways, the cars were inefficiently designed for passenger entry and exit. Newer PAYE cars like the “Old Pullmans” could board a crowd waiting at a car stop and be on their way while passengers stood on the platform fishing for change, but the Jewetts needed to wait while passengers boarded single-file and passed the conductor just inside the rear door. 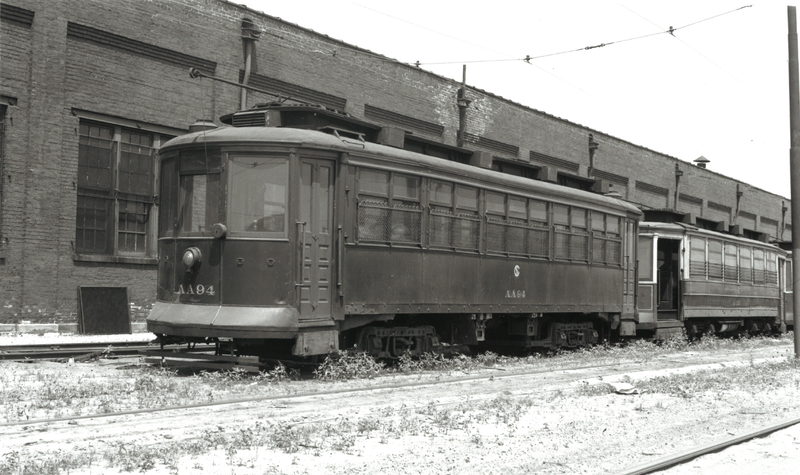 This made them much slower than the newer and larger PAYE cars and made them unsuitable for the increasingly popular lines through South Chicago and onward to East Side and the interstate through routes. In 1921 they were transferred to other, more lightly-patronized east-west routes on the far south side, the 106th, 115th and 119th Street lines. These were short routes, all less than two miles long, that only used one or two cars each in regular service. But while the CSL had just recently obtained permission to begin operating one-man cars (the first were a handful of single-truck Birneys delivered in 1920), these south side lines all crossed at least one steam railroad at grade. That meant that a conductor had to be carried so that he could precede the car onto the railroad crossing and flag it across. For five years, until November 1926, the Jewetts operated on these lightly-used lines in the East Side and Pullman neighborhoods on the periphery of the old C&SC territory. Car 2843 is shown as it appeared for much of its time in service on the CSL, in carmine red and cream with later modifications like Utility roof ventilators and metal sheathing on the sides. This photo, likely from the 1930s, was taken at Lawndale Car House. Krambles-Peterson Archive. In December 1926 the CSL converted the 103rd Street line, a 2.5-mile long ex-CESR route along its namesake street between Cottage Grove at the east end and Vincennes at the west, to one-man operation. Though it was lightly-traveled by CSL standards it used three or four cars and had one at-grade steam railroad crossing (the route stopped just short of the Rock Island line paralleling Vincennes, avoiding a railroad grade crossing). And here was where the Surface Lines saw its opportunity to save money: they hired a single flagman stationed at the Chicago & Western Indiana crossing on 103rd & Eggleston and dispensed with three or four streetcar conductors who had been needed to flag the cars across the crossing. The Jewetts were put into one-man service on 103rd Street at the end of 1926. But their short platforms continued to plague the five cars. With conversion to one-man operation, all passengers entered and exited via the congested front platform, slowing down the cars even further. When the Great Depression hit in 1929, ridership on the CSL decreased and newer cars that had been constructed with one-man service in mind became available for 103rd Street. In January of 1931 the five Jewetts were pulled out of service and put into storage. After 28 years of continual service their passenger carrying days had ended. 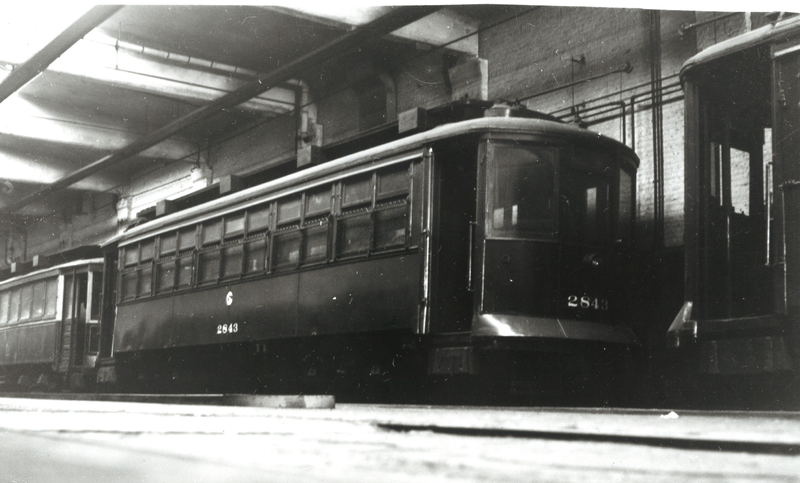 Car 2841 is pictured on September 12, 1942. Though unmodified from its passenger-carrying days, the 11 years it has spent in storage is obvious from the poor condition of the paint. In six months the car would be rebuilt for further service. Joe Diaz photo, Krambles-Peterson Archive. The Jewetts remained in dead storage for a decade. At the time CSL management, which was rather forward-thinking, tended to keep unneeded equipment around “just in case” for years and even decades. Single-truck cars from the turn of the century that hadn’t been used since the teens were stored until the Depression; center-door trailers retired around 1930 were still around into the 1950s in many cases. And so it was with the Jewetts, which hung around mothballed until World War II. With the surging economy and the rationing of gas and rubber, ridership on the CSL exploded and management went looking for more cars to add to capacity. Fortunately the Jewetts were available. In October 1942 one of the Jewetts, car 2844, was rehabilitated at South Shops and sent to Burnside car house for service. The station superintendent there wanted nothing to do with the car; even as stretched as the Surface Lines was, an aged car poorly suited for one-man operations was not what was desired. So the car was sent back to South Shops and the decision was made that the Jewetts instead would be converted into salt cars. About a decade earlier the CSL had begun using salt as a major component of snow removal operations when it converted about 50 old Chicago Union Traction cars into salt spreaders. In April 1943 the Jewetts had their seats removed and salt bins added along with chutes and holes in the floor for spreading the salt onto the track. They entered seasonal service helping to keep the south side lines clear of snow. Soon after repainting in work car green, car 2843 is pictured stored at Archer Car House on November 12, 1945. By this time it has been in salt car service for over two years. To the right is another one of the Jewetts in work car green. Tom Desnoyers photo, Krambles-Peterson Archive. And this is what kept these unusual cars around for a few more precious years. All five lasted until the takeover of the CSL by the Chicago Transit Authority in 1947, after which salt cars were renumbered into the AA work cars series. Cars 2841-2845 were, for one final time, renumbered in proper sequence as a group, this time as salt cars AA93-AA97. As Chicago’s street railway system rapidly contracted during the early CTA years, the Jewetts were scrapped between 1951 and 1958. All, that is, except one: car AA95. That one car, AA95, was squirreled away on a storage track at South Shops along with a few other relics and oddballs including one of the ex-SCCR “Interstate” cars built at Ewing in 1907 and some ex-Chicago Union Traction (CUT) cars. And there it sat, surrounded by hundreds of newer streetcars being burned and cut up for scrap metal, until by early 1958 nearly the entire Chicago streetcar fleet had vanished. That year the Electric Railway Historical Society (ERHS) began buying up the few old wood cars that hadn’t been scrapped. ERHS was a small group of streetcar fans that had elected to begin their own trolley museum after the Illinois Electric Railway Museum, located on a small plot of leased land in North Chicago, had declined to acquire more than one Chicago streetcar (that car was CSL 144, one of the 1908 Chicago Railways “Old Pullmans”). So the ERHS bought the cars on that storage track at South Shops, beginning with ex-CUT “bowling alley” 1467 in early 1958, and moved them to a farm in west suburban Downers Grove. “Matchbox” 1374 was bought later in 1958 and the two ex-SCCR cars – “Interstate” 2846 (work car number AA98) and then Jewett 2843 (AA95) – arrived in December. All four cars had been converted for salt car service and had lost their seats but otherwise were acquired intact with the exception of car 2846, which was acquired sans trucks. Salt car AA94, formerly 2842, is seen in storage at 77th Street on July 2, 1949. Bags of salt can be seen piled up over the bolsters through the windows. Though owned by CTA the car still wears CSL emblems. Tom Desnoyers photo, Krambles-Peterson Archives. The Jewett, 2843, was pretty much left alone. 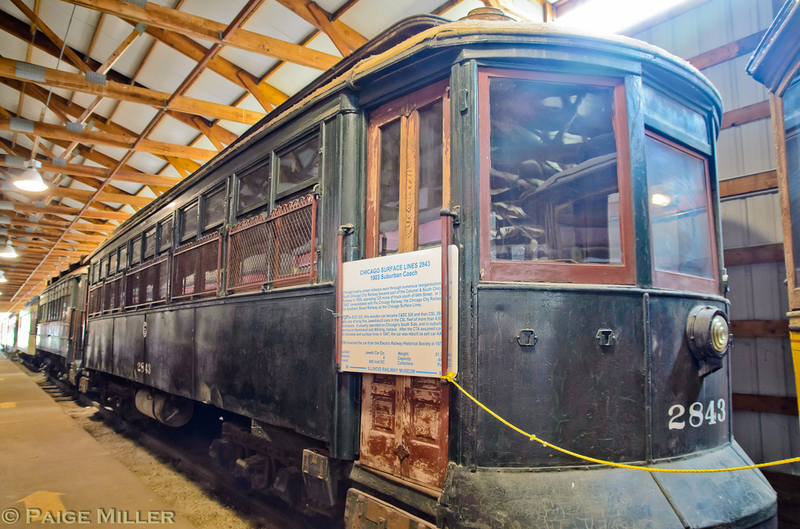 A sturdy storage barn was built by ERHS around the small collection of Chicago streetcars (several other cars joined the original four salt cars in the ensuing years), protecting the 2843 from the weather. In 1973 the ERHS was dissolved and its entire collection was donated to the Illinois Railway Museum, which by now had moved from North Chicago to Union and had the space and resources to acquire and house the varied collection of Chicago streetcars from Downers Grove. Part of the agreement was indoor storage for these cars in Union, so car 2843 was moved from its barn at the ERHS site into a barn at IRM. By the 1980s it had found its way to Barn 7, where IRM put its collection of Chicago streetcars (most of them from ERHS) on display, and there it has sat since. This is what car 2843 looks like today, on public display in Barn 7 in work car green. Photo copyright Paige Miller, authorized for use on Hicks Car Works. Car 2843 was given a coat of work car green paint years ago and was returned to its WWII-era CSL number, but other than that and the recent restoration of its 1910-era “south side style” window guards, it has been left essentially untouched since 1958. The car retains its trucks and motors, all of its control and air brake equipment save for its air compressor, and its interior is basically intact except for seats. Its condition is almost entirely unchanged since it was converted for salt car service in 1943. It still retains its in-service canvas roof in good condition, and still has the metal side panels that were screwed over the tongue-and-groove siding (the 1920s-era red paint and pin-striping can clearly be seen under the green paint on the metal panels; what older paint may remain on the siding underneath them is unknown). But the car’s condition suffered from years of salt car service, causing extensive corrosion to the floor and frame of the car. The precise extent of the deterioration is unknown but it is likely similar to what was found on “Matchbox” 1374, which was used in similar service, during a restoration effort in the 1980s that stretched to over a decade. These photos show some of what car 2843’s interior looks like today, though the car is used for storage and much of its interior is inaccessible. The photo of the platform shows controller, brake stand and hand brake still in place; the handle over the brake wheel was installed in 1914 when the car was converted to PAYE fare collection. The photo of the end bulkhead shows the car number and the mounting bracket for the fare register. To the right of it can be seen where a second fare register, for ringing up Indiana fares during interstate service prior to 1921, was once mounted. IRM Collection. Is car 2843 restorable? Yes, of course – with enough time and money, virtually anything at IRM is. The SCCR Jewett is a better candidate than some due to its completeness but likely a worse candidate than others due to its years as a salt car. 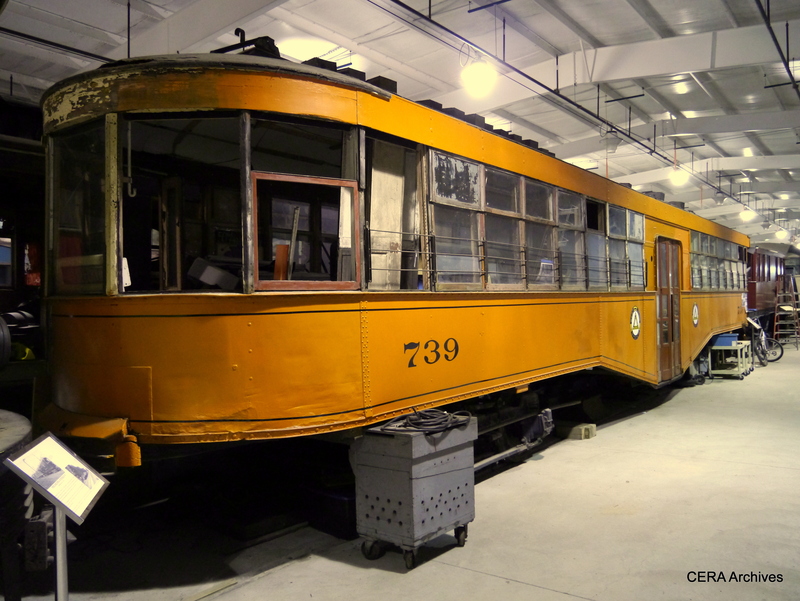 For now, it is significant as one of the oldest Chicago streetcars at IRM and as a relatively little-modified artifact from before the Board of Supervising Engineers era. It is stored indoors, on public display, and is preserved for the future. For now, this proud product of Jewett and jewel of the South Chicago fleet patiently waits. Arnold, Bion J. and George Weston. Detailed Exhibits of the Physical Property and Intangible Values of the Calumet Electric Street Railway. Chicago, IL: Traction Valuation Commission, 1908. Arnold, Bion J. and George Weston. Detailed Exhibits of the Physical Property and Intangible Values of the South Chicago City Railway. Chicago, IL: Traction Valuation Commission, 1908. 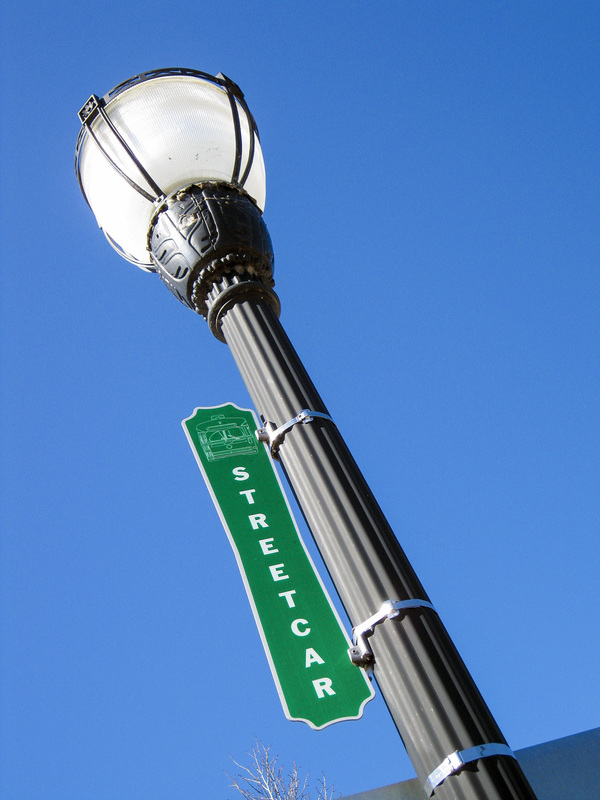 Benedict, Roy G. Streetcars Among Chicago Streets Named With Numbers and Letters. Unpublished essay, 2014. Brough, Lawrence A. and James H. Graebner. From Small Town to Downtown: A History of the Jewett Car Company, 1893-1919. Bloomington, IN: Indiana University Press, 2004. Buckley, James J. and Roy G. Benedict. Chicago Surface Lines Cars 2841-2845. Unpublished essay, 2014. Calumet & South Chicago Railway. “D.T. 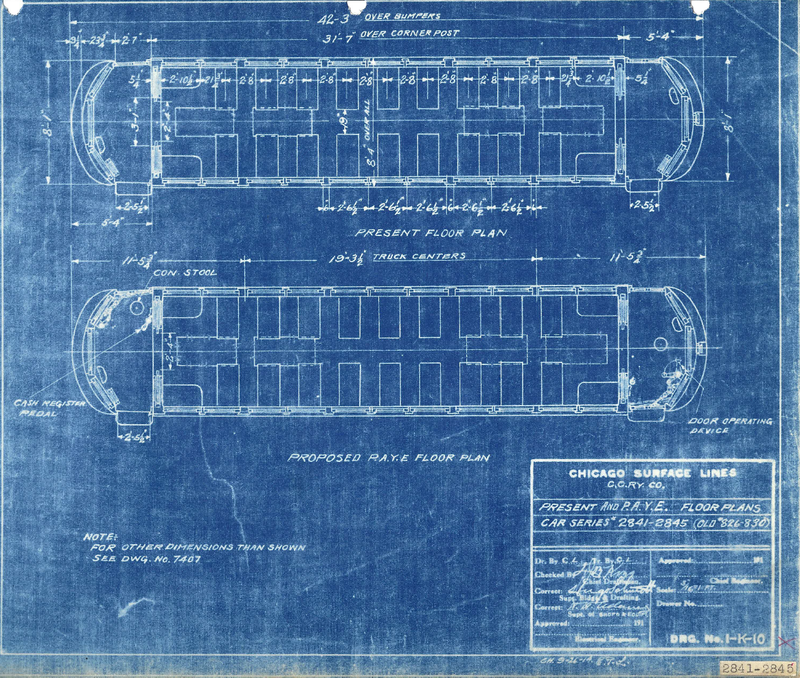 Pasenger Cars Series #826-830.” Blueprint, 1914. “Chicago Approves Consolidation – Other Affairs,” Street Railway Journal 11 April 1908: 623. Chicago Surface Lines. “Proposed P.A.Y.E. Floor Plan, Car Series #2841-2845 (Old #826-30).” Blueprint, c1914. Lind, Alan R. Chicago Surface Lines: An Illustrated History, Third Edition. Park Forest, IL: Transport History Press, 1986. Moody, John. “Calumet and South Chicago Railway.” Moody’s Analysis of Investments, Volume II, Public Utilities and Industrials. 1916. Sellers, Rod. Chicago’s Southeast Side Industrial History. Chicago, IL: Southeast Historical Society, 2006. Come join us for an evening with Art Peterson as we celebrate the centennial of the birth of his uncle,George Krambles. We’ll take an intimate biographical look and celebrate the life of one of CERA’s founders and former CTA executive director. Eric Bronsky shared these photos taken at 56th Street and 1st Avenue in Kenosha during a Skokie Park District Seniors outing on March 11. 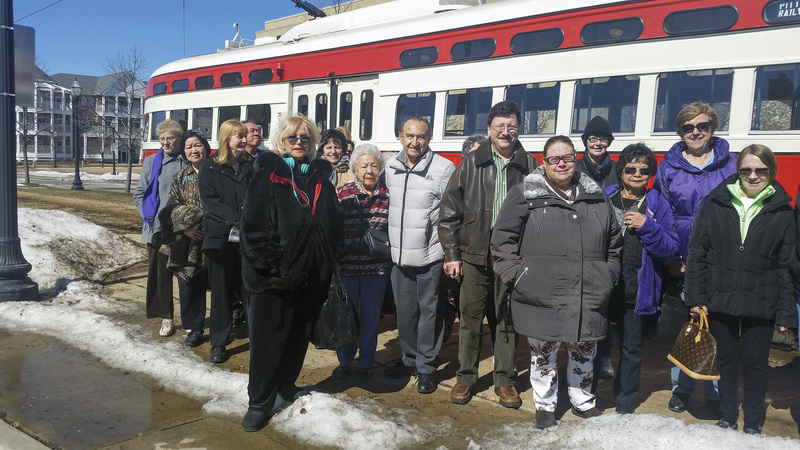 Having helped to plan the trip to the Kenosha Public Museum and the nearby Jelly Belly warehouse, Eric ensured that a streetcar ride would be one of the day’s highlights. Coincidentally, only the day before, Jelly Belly publicly announced plans to close their Wisconsin facility and relocate to Tennessee. 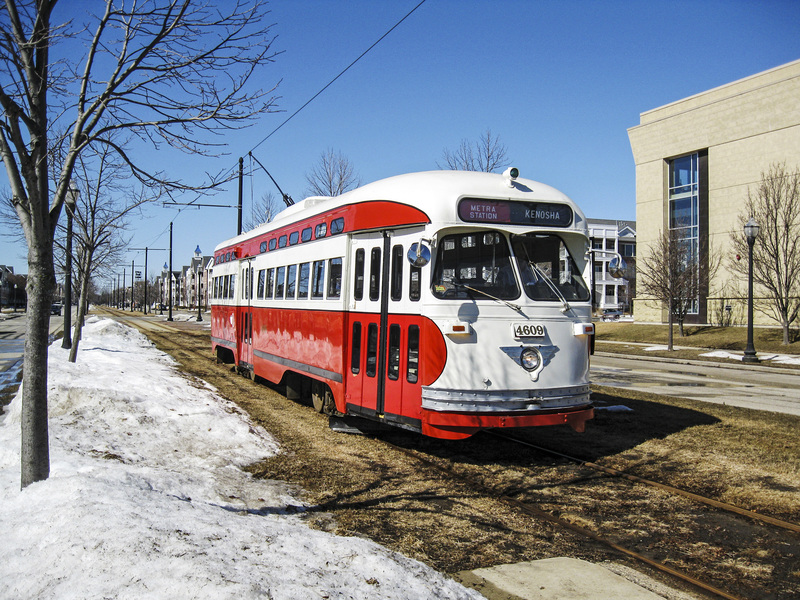 PS- CERA is a strong supporter of the Kenosha streetcar and we have featured it in several previous posts. You can find these here. CTA 7216 southbound on route 22. It’s August 28, 1936 on north Ashland Avenue, and time for a parade. One week earlier, streetcar service had been extended north of Cortland in one of the final extensions under CSL. Prior to this time, this portion of the route had run on Southport, two blocks to the east. North Chicago Street Railroad “Bombay roof” horsecar 8 is ahead of the experimental 1934 Brill pre-PCC car 7001. Ironically, the older car survives at the Illinois Railway Museum, while 7001 was scrapped in 1959. Check out the barber stripes on the 7001’s trolley pole. We will visit and view traction operations in the Pittsburgh area. Electric traction in Pennsylvania proved to be an enduring institution, with many lines surviving into the 1950s. Even today, we can still ride electric cars in the Pittsburgh and Philadelphia areas. Pittsburgh Railways PCC 1467, built in 1941 by St. Louis Car Company, is preserved at the Pennsylvania Trolley Museum in Washington, PA.
Two DVDs will be shows, with footage transferred from movies.Pittsburgh Railways 16 mm color footage from 1951 to 1963, features interurbans, suburban, and city lines back in a time when it seemed that streetcars could be found everywhere in Pittsburgh. A combination of PCC cars and older equipment will make this trip back into the past an enjoyable experience. West Penn Railways features Greensburg to Uniontown main line and the branch to Latrobe. Tight curves, spectacular bridges, and steep grades were all part of the West Penn experience that made is so memorable. Our Annual Meeting will take place between showing of the two DVDs. Three candidates will be elected to the CERA Board of Directors, and administrative reports will be presented. 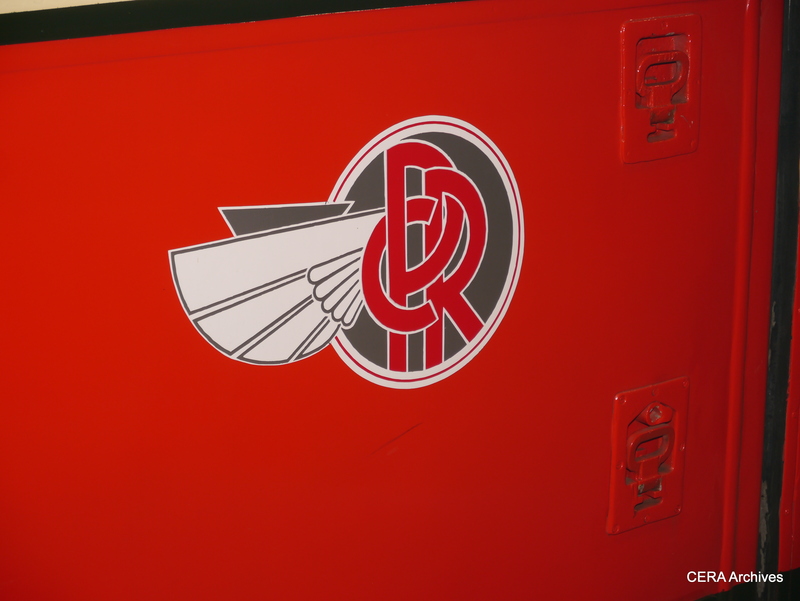 Pittsburgh Railways had a very attractive logo, as seen on PCC 1711 at the Pennsylvania Trolley Museum. West Penn Railways car 739, now preserved at the Pennsylvania Trolley Museum. July 25, 2015, marks the 60th anniversary of the North Shore Line’s “Shore Line Route” abandonment. January 21, 2015 marks the 52nd anniversary of the total abandonment of the railroad. Tonight we will view various aspects of the beloved North Shore Line through an encore presentation of the 50th Anniversary North Shore Line Program which was originally presented at CERA on January 25, 2013. North Shore enthusiasts never tire of seeing visual representations of their beloved interurban when all was still operational and every day was “business as usual” even in the shadow of protracted abandonment proceedings. If you missed this program the first time around, here is your chance to see this famous and colorful interurban brought back to life in an engrossing collection of digitized and restored black-and-white and color film. Join us for an evening on the North Shore Line. Crying towels are in limited supply and available upon request. The Annual Membership Meeting has been postponed until February. The Audit Committee requires additional time to complete its review of CERA’s finances and issue an up-to-date report on the organization’s financial state to its members. Also, there are three Board of Directors positions up for election, but to date we only have the names of two candidates to place on the ballot. If you would like to give of your time to CERA and are interested in serving on the Board, please contact Nominations Committee Chairman Raymond DeGroote by email at rdg6018ray@yahoo.com.